Cryptolume has available, a binance trading tool for seasonal traders that can make great use of the exchange as we are connected directly into their API and the information that we’re able to provide has taken trading to a whole new level. Not only this but it also serves as a great volume monitoring tool to find quick changes across the board and visually through a graph and our table as demonstrated above. With Cryptolume, you can now find moving cryptocurrencies on Binance faster than ever before. We do this by collecting data from the exchange in real-time and then running calculations on our backend to produce statistics that will save you hours in trading. 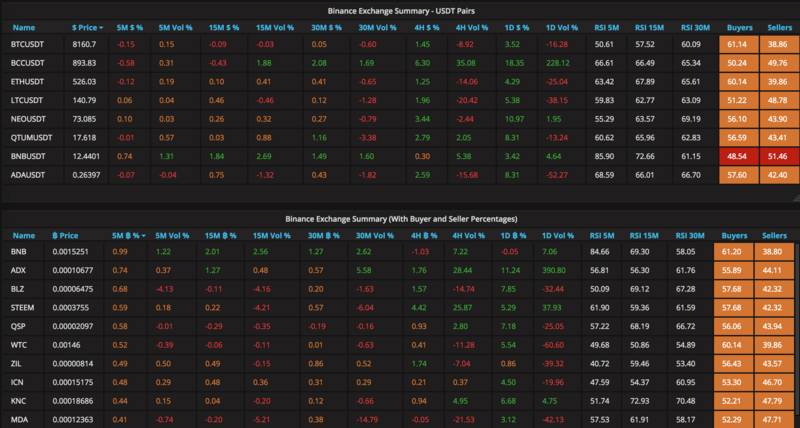 The Exchange Summary tool (Exchange Explorer) allows you to see a table view of what’s happening with every cryptocurrency on Binance. This allows you to sort via different candle timeframes such as 5 minutes, 15 minutes and so on. You can sort by metrics such as Volume, Price and even RSI. 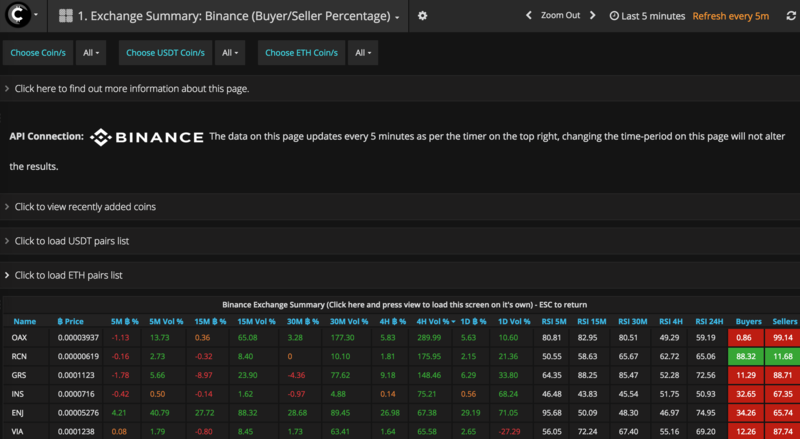 You can also see the current live order book statistics to see how many buyers and sellers are in each coin, all through a glance by using our table structure. 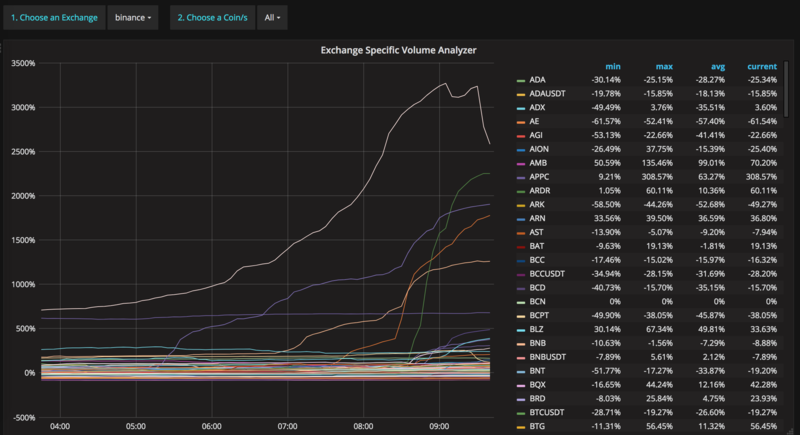 Comparing this alongside monitoring volume through the various timeframes, gives quick ideas of where the market is moving. This is one of the favorites by our traders and continues to be used in volume everyday, with hundreds of users utilizing Cryptolume to make use of the in-depth information produced by the in-house calculations. 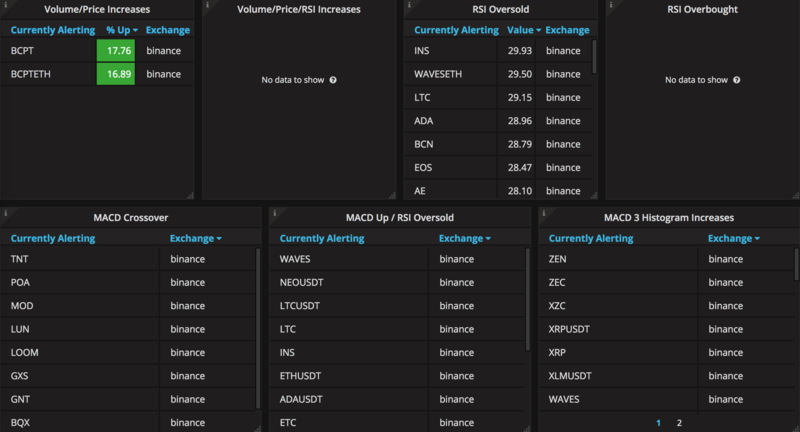 Alerts on RSI, MACD, Price Volume/Increases & More! With our Exchange Based Alerts, a new feature developed by Cryptolume you are now able to receive alerts for movements such as Volume/Price going up, MACD crossovers, MACD histogram increases with RSI oversold and Volume/Price/RSI increases. This gives you an edge over the market of traditional TA (technical analysis) as it allows you to easily find what’s moving in terms of typical stock trading patterns as the system digests it for you. This is similar to a stock scanner that you would see in normal stocks today. 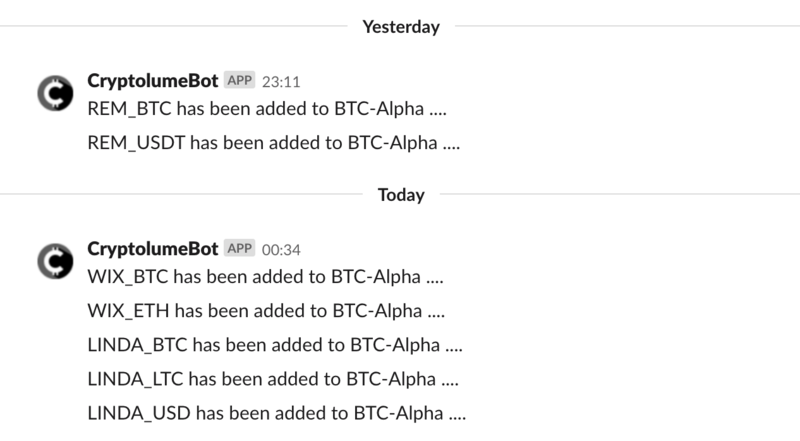 Not only is this available via our easy-to-use web UI, it is also available to receive Desktop/Mobile notifications for cryptocurrencies via our Slack integration. We provide updates every X minutes/hours depending on the timeframe you’re looking at for every cryptocurrency on Binance with BTC/ETH/USDT pairs. You can receive alerts from the moment that a Cryptocurrency enters the exchange through our UI and also via Desktop/Mobile push notification. Cryptolume’s Binance Scanner and Volume Monitor Tool gives you a real edge over the market, and saves you hours per day in trading through Technical Analysis that is achieved via the algorithms developed inside Cryptolume. More and more indicators are created and we continue to strive to bring a platform that will allow traders to get the most out of their exchange. Cryptolume has been around since October 2017. We’re one of the only tools that stays around through bearish/bullish markets and provide data for timeframes as fast as 5 minutes. Don’t miss out on a great opportunity to sign up now as we have 30% off on yearly memberships. We also provide a 48 hour money back guarantee. Many tools would only accept payment via Crypto however we give our buyers security via PayPal, Stripe or Cryptocurrency payments. Click here to find out more about Cryptolume and become a subscriber today.